We know what is autocomplete in input type, that is make some predefined entered texts come under the input type box, while focusing on the input type, similarly we are searching some content from mysql database, this actually facebook style search concept to suggest some data for select before we get the exact search, for that we are using this kind of search, and this is very simple to make search in php, mysql with ajax and jquery. let see it in brief. 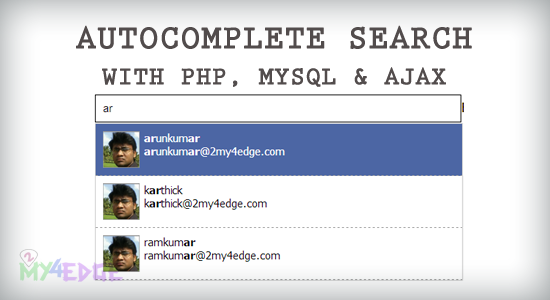 as like you see in the above image, the search will be comes like that by using php, mysql and ajax with jquery. the above is database file. the above all for make action in SEARCH page with out refreshing the page. that's it. as like the usual fetch from database with like and here we are just adding str_ireplace, that's it. and other thinks are as like we know, that is very simple one. let's try this. and each of our entering text that wil comes as in strong letter. When you search, and click on the image or text, it will not be selected. You have to click in the "white" area. Antoher bug is that it is case senestive. If you search for "a", all "a" will be small in the search output. If you search for "A", all "a" will be in capital. Is there anyway your could combine this with http://www.w3schools.com/php/php_ajax_database.asp? "When you search, and click on the image or text, it will not be selected. You have to click in the "white" area." Hi, thanks for the excellent tutorial. I have configured this so that when an item is selected from the drop down box, it updates the input box and then a Submit button can be used to direct you to a specific URL. This works fine but its very temperamental and doesnt always update the input box straight away. Ideally, I would like the selection from the drop down box to automatically direct you to the URL rather than the user having to click on the Submit button as well. Any suggestions? Is this a tweak to the JQuery? Am I doing something wrong? I am on IE11 if there is an incompatibility with that? Works like a charm! I only have one problem, that is if i click the input off focus, the current search results (in the #result) do not disappear. Anyone know what that is? i want to search through ajax all field of data base like search by name, search by number, search by area anything user want to search. I have the same problem with others, any solutions? Ugh, a coding blog that doesn't accept HTML inside a comment? That's awful. Works for me. Can click anywhere in it and it works. Put onclick='fill("")' within div tag. and you don't need span tag. added a column `link` to mysql and search.php, how to make the the search results clickable to go to the corresponding link? ie on click first result, go to google.com? Works great and I have adapted it to suite my needs. BUT - I have noticed the script conflicts with bootstraps Modal Fade. When the script is on the bage the fade no longer works. This doesn't work for me in IE 11. Works fine in FF 28 and Chrome 34. I say "fine" lightly. I too have issues with clicking within the result div, sometimes it doesn't work. I applied the suggestion made by Rob Whit and I can click anywhere, thank you! IE support would be great, though. why mine couldnt work? can you help me with this plssss. Hope that helps someone looking at this now. Amazing! Very beautiful e useful auto-complete functionality. I have just one question. Are there any way to navigate with this options by keys up and down from keyboard? Is there any way to navigate suggestions with up and down arrows from keyboard? Yes, its very beautiful but has some bug. When i click on text(name of people) or photo too, it is not select.. Thanks, now i can make my own autocomplete search fiture. Very fantastic code. Thanks for your wonderful work. But there small problem here, when the search list is too long, could web make a scroll bar and limit results to 5 or 6? I did it, just insert a div with style "height: 300px; overflow-y: auto;" (the dimension is up to you). How can I change the script to pick the email instead of the name for the input field? and remove "name like '%$q%' or"
I ended up adding class="email" on the div in search.php and changed the ".name" to ".email" on the ajax code in index.php. How can we align the div result at right of input box? "that is also comes"? Go back to school, ffs. Thank you. Really it is nice. Hi anyone fixed the issues yet? 1. "When you search, and click on the image or text, it will not be selected. You have to click in the "white" area." How can i get the selected image or text value to appear on the text field ? how can i insert or select togather img and text and echo same div and if i wanna only text then echo only text and if only img then only img echo ? have liked me so much ! i tried this script and it's i need. but there is a function which is not present : the multiple search with unordered words. in the Database i have for example : " hello world, my name is john"
Someone has a solution for this problem ? I cant pic the item from this list how could i do that! Nice script, but unfortunately it does not work on iPad. Cannot pick the item from the result list. This is extremely helpful. Thanks man! Does anybody know if there is a way to do this without JQuery??? How to auto submit on clicking the autocomplete result. Warning: mysql_fetch_array() expects parameter 1 to be resource, string given in ...in search.php line no. 7 i'm getting this error..
Great auto complete search, is there a option to show that there are no results in the database that match the input? Is it possible to view a text when no search results are found? Is it possible to view a comment when no results are found in the database? Nice example , but how to make the example responsive for all the screens ? Thanks a lot brother.very helpful.. Thanks a lot.Very useful script. Could you create this with CodeIgniter 3?